Listed below are the general requirements governing professional master’s degree programs. For policies pertaining to the Master of Laws (LLM) degree, which deviate from these general requirements, see the LLM program description. Admission. An applicant may be admitted as a prospective candidate for a professional degree upon the recommendation of the major department and approval of the dean of the Graduate School. Residence. The minimum residence requirement for most professional master’s degrees is two semesters, which do not have to be consecutive. See the following program descriptions for specific requirements. Time Limit. All requirements for a professional master’s degree must be completed within six years beginning with the first registration for courses on the student’s program of study. An extension of time may be granted only on conditions beyond the control of the student. Language Requirement. A candidate for a professional master’s degree is required to show correctness and good taste in the use of both written and spoken English. Program of Study. A program of study should be prepared by the student and the major professor during the student’s first semester in residence. This program of study, approved by the major professor and the graduate coordinator, must be submitted to the Graduate School by Friday of the second full week of classes of the semester in which degree requirements are completed. If degree requirements will be completed during summer term, the program of study is due by Friday of the first full week of classes. No grade below C will be accepted on the program of study. To be eligible for graduation, a student must maintain a 3.0 (B) average on the graduate transcript and a 3.0 (B) average on the program of study. Application for Graduation. An application for graduation must be filed with the Graduate School no later than Friday of the second full week (the first full week for summer) of classes in the semester of the anticipated graduation date. Application forms may be downloaded. In-Service Credit. A maximum of 18 hours of graduate in-service course credit taken at non-resident centers may be included in certain programs. This maximum will be reduced by any credit transferred from another institution. A student is responsible for contacting the department in which he or she is enrolled to ascertain if in-service courses are acceptable on the program of study. Accepting Credit by Transfer. Graduate work taken at an accredited institution which constitutes a logical part of a student’s program of study may be transferred if recommended by the student’s major professor and graduate coordinator and approved by the dean of the Graduate School. Such transfer of credit cannot exceed six semester hours, cannot reduce residence requirements, and must fall within the time limit of the degree. Transfer credit cannot be used to fulfill the requirement that 12 semester hours on the program of study be open only to graduate students. No grade below B may be transferred. The courses to be transferred may not have been used as part of the requirements for another degree. Transfer grades are not used in calculating semester and cumulative averages. All requests for transfer credit, with accompanying official transcripts, must be in the Graduate School at least by midpoint of the semester in which the student plans to graduate. A combination of in-service and transfer credit may not exceed 18 semester hours on any program of study. Thesis. If a thesis is required for a professional master’s degree, inquiry should be made to the appropriate department concerning procedures to be followed. Final Examination. The candidate must pass a final examination administered by the department. If an oral examination is given, it must be administered by a committee of no fewer than three faculty members. The results of this examination must be reported to the Graduate School by the major professor. This requirement has been waived for degrees offered in the Terry College of Business. Registration Requirement. 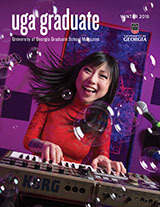 A student must be registered at the University of Georgia for a minimum of three hours of credit the semester in which all degree requirements are completed, unless additional stipulations are required by other units of the university.